It seems that some of the most successful people in the world, at some of the world’s largest and most respected companies, engaged in an apparently wide-spread and illegal effort to limit employees’ job opportunities and wages. This was stupid. It was stupid for the obvious reason: it was illegal. It was stupid for a more insidious reason, though: it will backfire on the company. We can explore why if we use a couple of system archetypes to think about the situation. These archetypes will come in handy in a wide range of situations. The problem was retaining talent, who could be easily enticed away by more attractive compensation packages or to work at more exciting companies. Either it was easier to get an attractive compensation packages at a competitor, or the work did not stay sufficiently interesting or engaging. Simply put: employees were not happy enough. The fix was to limit recruitment among competing companies. In systems thinking, this is a classic “shifting the burden” dynamic. In shifting the burden, pictured below, you have two types of solutions to the symptoms of a problem: the fundamental solution—a corrective action for the root cause—and the symptomatic solution. The symptomatic solution reduces the symptom, but also creates a side effect that has a negative impact on the fundamental problem. Symptomatic solutions only have a temporary benefit before things get worse. The classic shifting the burden system archetype describes wage-fixing practices as solutions to employee turnover. 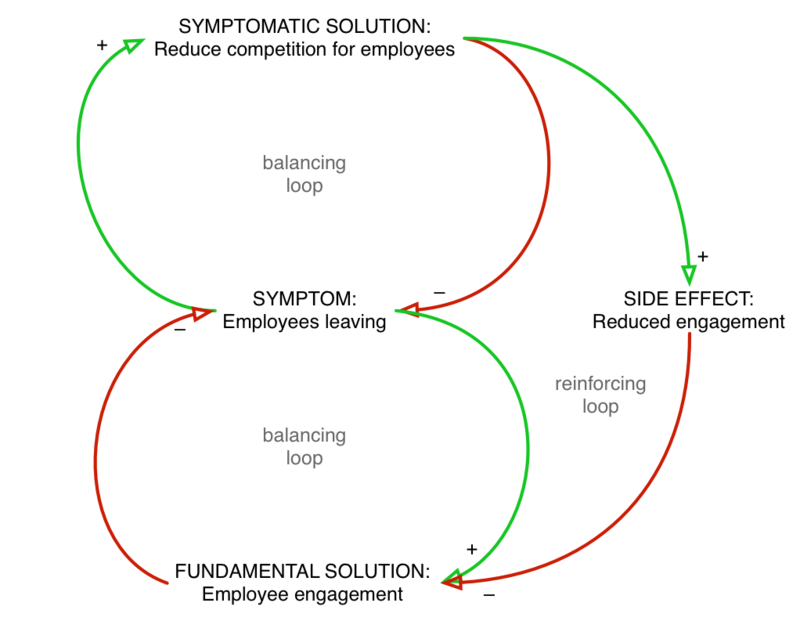 The green links, labelled “+,” indicate that the two conditions at either end of the tail increase and decrease together. The application of more symptomatic solution causes an increase in the side effect; reducing the use of symptomatic solutions causes a decrease in the side effect. The red links, labelled “–,” indicate that the two conditions at either end work in opposite directions. An increase in the side effect causes a decrease in the effectiveness of the fundamental solution. and increases the side effect. The solution is to focus on fundamental solutions—get at the root cause—and avoid or limit reliance on symptomatic solutions. Symptomatic solutions are always temporary and usually make things worse in the long term; fundamental solutions are permanent and don’t have negative side effects. Why employees leave is also explained, in broad strokes, by another system archetype: the limits to growth. The classic limits to growth system archetype describes why it’s hard to keep employees engaged and hold down turnover. Here we have a self-reinforcing dynamic created by successes and interesting work with good compensation. Over time, employees should generate more success and have more interesting work and better compensation. However, this is coupled to a balancing loop that becomes stronger over time, and slows down the reinforcing loop, like the brakes in a car. Employees burn out, or generally stop producing as much. 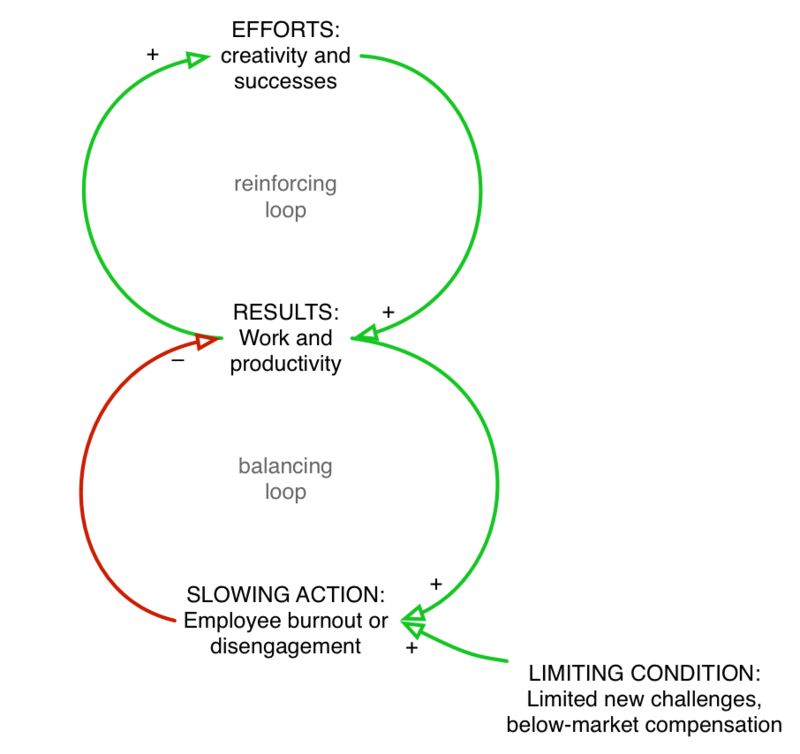 This balancing loop is driven by some limiting condition, which makes the slowing action—burnout or disengagement—stronger over time. While this simple version looks like it will lead to a steady state, more realistic versions often result in a crash, where the results not only level off, but actually decrease. The solution to a limits to growth system is to attack the limiting condition. If employees get bored doing the same thing over time, then you have to find a way for them to be engaged with enough new, interesting work. If they can earn substantially better compensation packages at competitors, then you have to (approximately) match those packages. If you don’t fix the limiting condition, you might see a temporary improvement via the dynamics of shifting the burden (or the closely-related archetype, fixes that fail), but in the long term the problem will only get worse.